How to Defeat Your Own Clone is in bookstores now! Have you recently had your identity stolen by a rogue clone double? Did the government sequester your DNA for its newest "army of cloned super-soldiers" project? Well, you're not alone. As the biotech revolution advances, this type of blatant misuse of biotechnology is only going to get worse. If you want to survive, you'll need to prepare yourself for a world filled with genetic body upgrades, mutant food, and yes, human clones. The future is now, people, and while it can be a little scary, there's no reason you can't meet it head on. 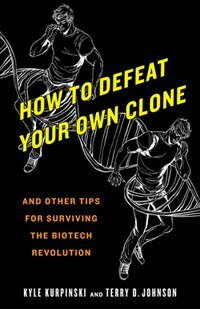 How to Defeat Your Own Clone: And Other Tips for Surviving the Biotech Revolution is the only official guidebook for surviving (and thriving) in our genetically enhanced future, because really, you have no other choice. Check out the web trailer or find more videos here. A "terrific look at cloning"
"Fun to read, thoughtful, and thought provoking"
"If it ends up in the hands of enough young minds, it could inspire a number of future biotech scientists"
"I wish all non-fiction books would work as well as this"